As the game that kicked Tengen’s Tetris” The Soviet Mind Game off of the shelves, Nintendo’s Tetris had a lot to live up to. Unfortunately, and perhaps because they had a monopoly on the market, Nintendo chose to release a decent but entirely unimpressive port of Alexei Pahjitnov’s classic puzzle game. Gone are the head-to-head and co-op 2-player modes, and traditional Russian music and presentation. The game features two single player modes; normal marathon mode (A-Type) in which you simply try to complete as many lines as possible, and a second mode (B-Type) in which you must complete 25 lines before your stack reaches the top of the screen. In B-Type, you choose a level to start out with which determines how full of randomly-placed pieces your stack will initially be, thus increasing the difficulty level. After completing a game of B-Type, an animation is displayed showing various objects flying past the Kremlin. If you earn a high score in marathon mode, you get to watch what I assume is a Soyuz rocket launched into space from the Kremlin’s backyard, but this is the extent of the game’s Russian flavor. Included are three songs, one of which is “Dance of the Sugar Plum Fairy” from “The Nutcracker” by Pyotr Tchaikovsky. The other two songs are ostensibly in-house compositions by Nintendo. Missing is “Korobeiniki”, the Russian folk song which has become forever linked with Tetris thanks to the Game Boy version of the game. Graphically, I do like the fact that the color scheme changes after every 10 lines, and that each block is a unique color. The blocks are also more detailed and are shaded to make them look like 3-dimensional tiles, but Tetris is about gameplay, not eye candy. While the gameplay is solid, the difficulty ramps up much more quickly in this version than in the Tengen version. Tengen’s Tetris ramps the difficulty logarithmically, meaning that it increases slowly and evenly. Nintendo’s Tetris simply doubles the speed of the game with each level, meaning that a level of virtual impossibility is reached more quickly. 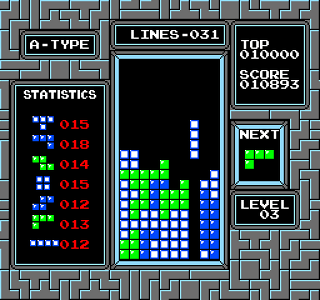 There is nothing blatantly wrong with Nintendo’s Tetris but there is also nothing that stands out as being exceptional, and the game is lacking in several areas when compared to either the other NES version or the Game Boy version. The only advantage this game has over Tengen’s offering is a much more accessible price point. Tagged NES, Nintendo, Puzzle, Review, Tetris. Bookmark the permalink.